Elle revient (je suis sûre qu'elle vous avait manqué...) : la photo du mois ! the downy feathered chests of proud hawks sitting timeless in highway side trees. and this morning i was up so early. pissed outside under the stars. 5:30 am. i thought of winter ravens. that maybe they fly at night. imperceptibly. between the dots of bright galaxies. and the bats must be asleep through this. skied through the cold today. a pure blue connection from me to the beyond. the horses wore blankets in immaculate fields. there's a natural order to things. harmony is the only option. did aristotle say the birds flew under the ice in winter? i'm incredibly positive these days. i see possibilities. i see hope. it's been a funny while in the music biz, i must admit. over the last year or so i've recorded a lot of music. my love and faith is restored every time i play live these days... but the studio is testing me... my patience, my faith. i feel the deck stacked against me... but i've never felt more focused and fresh... i made a record... finished it before christmas. somewhere between then and now it was shelved in favour of starting over again from scratch. the record felt like a lover i grew apart from... when it was finally completed we looked like strangers to each other. kiss... it's been lovely... i need to be alone. i've been working with my brilliant neighbour and friend andre wahl... he's a real clever kid who, back in the autumn picked me up and dusted me off... so we're planning to start again for real this time... early march. as i said earlier... playing reminds me of the importance of connection... i feel blessed to be able to travel and play. the starling tour saved my life... again i thank all those who shared those nights with me... it was a massive reconnection with myself and the music. over the next while i'm going to play a few shows... get back in shape... i want my voice to soar (not a sore voice though) when i get back into the studio... so please i say... reach for what's positive... cherish love and peace... seek it in heart and mind... i have such a wonderful feeling for the year. may wisdom be yours too. h.
Hop, hop, on ouvre la porte, on dépoussière, on nettoie et on s'installe. Bonne année à tous ! et pour bien commencer l'année, une bonne nouvelle. Hawksley Workman sera en concert au Nouveau Casino (Paris) le 12 février. A vos places ! Des nouvelles du monsieur ! a while back i unplugged. no phone, computer, newspaper, radio, television. it was a bet with a friend. more a challenge. a challenge that i could live without the fear and confusion of these distractions. it does seem to be working. my reoccurring despair for the state of the world seems to dissolve in my not contributing fear and anxiety to the universe. not so much that ignorance is bliss... but that believing in goodness and passion and humanity still seems to work wonders with a weary heart. without my daily dose of medicine to stunt my spiritual outlook, i create happiness and opportunity without much effort. just breathing... this is what i always forget to do. my karate teacher, my opera coach, my medicine woman... they all say the same thing. "you never breathe". so many little steps to create a funny life. this summer was lovely for music and friends and inspiration. every time i play a festival my faith in our times is strengthened a little. they were wonderful and the sharing between audiences and artists was beautiful to behold. i even got to sing with my hero, bruce cockburn, in edmonton. the backstage of these festivals is the other amazing thing... so many musicians, who are normally all busy with their own lives and careers, backstage chit chatting and connecting... very lovely. part of my stay sane regime has been to be writing and making music as much as possible... i was in the studio writing and producing alot through july... a short stint with sarah slean, jully black, tyler hilton, and jeremy fisher, who i will continue to work with on a new record in the autumn. he's a brilliant and direct songwriter with a bright soul. he's also an avid cyclist... and bicycles always do a good bit to restore my faith in humanity... we're planning some bike trips between studio sessions. staying found is tricky. i get lost and then found and certainly lost again... funny movement. i guess the voice and the connection is my gravity. i truly thank for the opportunity to communicate through music. through september i will be playing shows with the wolves again... it'll be amazing to make a loud noise after the starling tour. i don't believe much in borders... but i did spend a good bit of time this year driving through canada... most recently in the western provinces... and have been reminded what an astonishing amount of beauty is contained within canada. i took the long way this time and savoured every moment. i wouldn't say it makes me proud... because it certainly isn't mine... but definitely i am blessed to behold such a thing and to have my very essence be influenced by the grand architecture and sky of such a vast and wandering land. i feel autumn outside. i see a stack of firewood that needs to come inside. i have been away from home for a long time... i missed my tiger lilies in july. maybe next year. till then, my friends... may peace and wisdom be yours. h.
Un tout nouveau forum ! La cuisine connaissant de gros problèmes, rendez-vous ici pour parler entre fans de l'actualité d'Hawksley. En plus des paroles de l'intégralité de Treeful of Starling, trois nouvelles tablatures sont disponibles sur le site : You and the candles, Goodbye to radio et Ice Age. A vos instruments ! A noter aussi, la venue d'Hawksley pour deux dates (pour le moment...) en France. Après de nombreux changements, la date de sortie française de Treeful of Starling est prévue maintenant pour le 13 mars ! 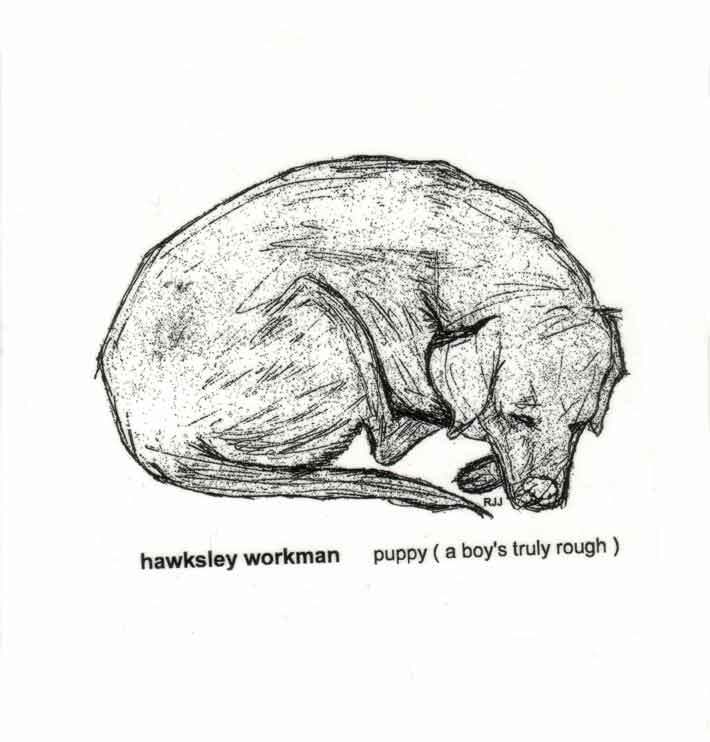 La sortie canadienne du futur album d'Hawksley Workman est finalement repoussée au 21 février. Enjoy ! Treeful of Starling s'annonce prometteur à l'écoute de ces quelques secondes de preview... Sortie prévue pour la Saint-Valentin le 14 février, un choix judicieux de cadeau pour votre amoureux(se)... ou pour vous-même ! Des news du monsieur ! where i am, the snow has arrived. even with no cold and if i was blindfolded, i would know it. snow brings an unmistakable and special quiet. in this peace i have the space to hear new things. the ravens make new songs to herald this arrival. i wonder how it feels for them to be so exposed now. they're beautiful ghosts in blue skies. trees begin to sleep. foxes act like children diving wildly into snow banks. a doe and her fawn, blindly find their footing. it all seems perfect. snow makes everything feel so infinite. roads no longer begin and end. they are passages through scenes of ongoing magic. a natural flexing of beautify that goes on even when you are asleep. i took my grandfather's old snowshoes out through the forest yesterday. i left tracks. i saw the tracks of other creatures that had gone through where i was. snow has a way of keeping score like that. and then rewrites the story when a new blanket comes to cover. i had seen that rabbit the other day. he'd already turned white to blend into this scene. now just his footprints were left here. this kind of change defines me. snow means i have to move slower. i'm forced to be careful. it's a good lesson. not careful in the sense of trying not to slip on the ice... but to operate with a fullness of care. to see and trust this delicacy. to be reminded that there are always larger things at work. things bigger than me... but far more graceful still the same. i'm the cumbersome creature in all of this. with my funny two legs and arms. with my puzzled gaze. this sort of beauty still perplexes. and even as i sit here and write, trying to share these visions, and all i have is words. i saw a sample of my blood on a microscope the other day. i had visited a naturopathic doctor about something and he'd put my blood on a screen so i could see what was going on. i felt like a kid. there my life was. red blood cells happily sitting, while the white ones, like the life of the party, undulated and grappled to make things pure... like the snow. i said to my doctor, that i could use to have this playing in my kitchen every morning... just as a reminder, before i started my day. a reminder that the smallest things are often so much bigger than what would appear to be the biggest things. this plays over and over in my mind. it was beautiful. lately the whole picture seems to be pointing to beauty's complex simplicity. as we push on in a world that seeks speed and new ideas, massive storage of information, and swift communication abilities, there are things going on so simple, it's baffling. so perfectly simple you're left wondering... "so what's the catch?". the "catch" of course, is that this is a liberating feature, if we choose to believe in this type of simple beauty. the more we worship speed and things that are temporary, the more we are leery of this gateway. the more we invite fear to be the ruler of our days. to believe in this infinite thing, is to let go of worldly worry and concern. to see the incredible smallness of that which is 'we'... somehow releases us to new freedom. even my body understands its grand purpose. those blood cells are creating their magic even as i fret needlessly about this or that. the rabbit turns white. the deer move in their own time. the fox plays in the snow. with this simplicity, i'm off the hook. not having to contribute anymore to this madness that we humans seem addicted to creating. an illusion of importance. the crazier things get... the more important we feel. i reckon we are most important when following the call of love, and truth. when the din of manufactured insanity is silenced. it is then when we see our mortality our purpose and our light. our resonance is now. not yesterday or tomorrow. and how beautiful and elusive that is. a choice to be peaceful and dedicated to awakeness! this is life, right here. and you can have a bite, if you choose to sit at the table. everyone has a seat. again, so simple. but we seem more comfortable with our addictions. noise and confusion. my wish to you this christmas season, and in the turning of winter, is peace and simplicity. and a wish that you feel the simplest things to your truest core. the snow and cold will purify. trust and fall into it. BE and be merry. I wish the best of beauty and of lightness to enter your worlds today and in days to come. Le nouvel album d'Hawksley, toujours prévu pour le 7 février, aurait pour nom Treeful of Starling. 40 (!) chansons ont été enregistrées à Toronto, il ne reste plus qu'à les trier pour n'en garder que "quelques-unes" pour ce nouvel opus ! La nouvelle que vous attendiez tous : selon certains dires canadiens, la sortie du nouvel album d'Hawksley Workman est prévu pour le 7 février. A vos agendas ! Demain débutera la tournée australienne (!). Hawksley accompagne ainsi sur quelques dates sa complice canadienne, Serena Ryder. Hawksley est actuellement en post-production de son nouvel opus. Une sortie avant la fin de l'année ? L'émission "Fuse" de la radio canadienne CBC propose un concept plutôt intéressant, réunir deux chanteurs et chacun apporte sa touche personnelle sur les chansons de l'autre... et en live ! Hier étaient ainsi diffusé 50 minutes de Hawksley Workman et du rappeur Choclair. En retard... nouvelle photo du mois ! "how winter persists. a purity that refuses to leave. cold and crunchy bones. this time has been important for me. i decided early in the new year that i should go walking in the desert, which i did. walking with coyotes and bugs. walking in sand and up hills. walking with my silence and my confusion. walking without anywhere to go. walking for the sake of feeling the ground beneath my feet. surrendering. making little beds. for peace and for sadness. making little beds for each to burrow honestly in. i woke up to see the sun rise every day. i wrote and drank coffee. i read and drank tea. i walked and drank water. i made new rituals. i made time to cry. this time has been very important for me. home now, i am deep in work on the new record. i have a little apartment that looks out over a road where cars move with fury. i like the energy of the city. time moves quickly these days with so many souls wishing collectively for spring to come. this is a great time to be alive. a great time to be an artist. a great time to be aware of blessings. a great time to celebrate peace and understanding. a great time to believe in music and community. a great time to be here now. in a kiss. in sadness or understanding. in finding or losing. in strength of being. peace and love are yours. Photos de Serena Ryder au Cabaret Sauvage (30 novembre) en ligne ! Superbes photos du Cabaret Sauvage ici ! Pour bien commencer l'année, une magnifique photo du mois !